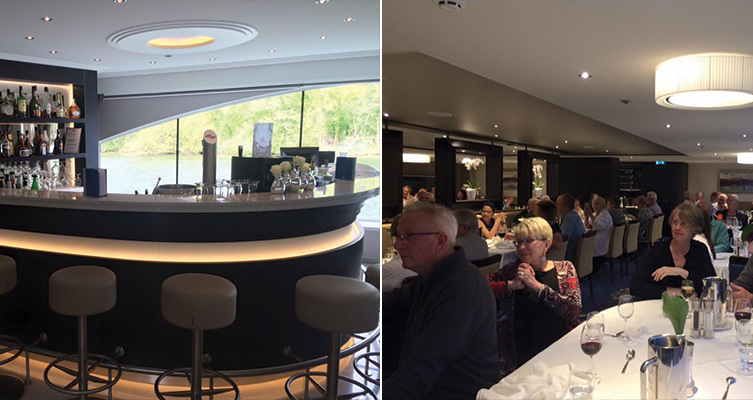 Debi of our dedicated Concierge Team and recently embarked on a 3 night sailing with Avalon Waterways onboard Tapestry 2. 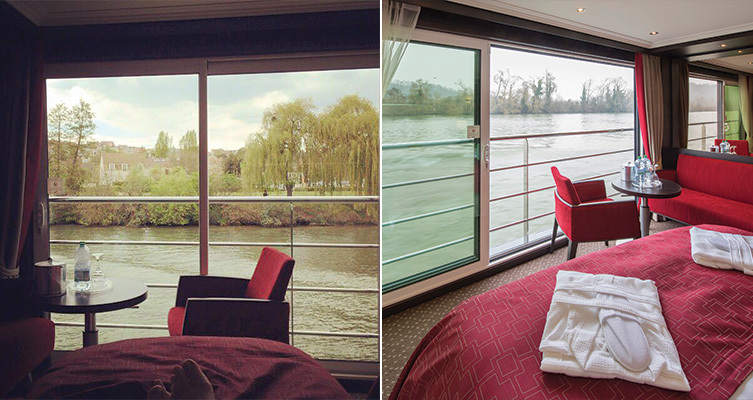 We boarded the boat just outside Rouen to complete our 3 night sailing. Luggage was taken from us dockside and we checked in very smoothly. Passports were kept for 24 hours and then returned back to us. The bathroom was very large indeed for such a small ship. L’Occitane toiletries supplied (shampoo, conditioner, shower gel, body lotion, hand soap) The cabin was quite small but they had placed the beds to face the window – you could get up in the morning, pull the curtains and jump back into bed to see the wonderful views outside as the ship sails along. Hairdryer, robes and slippers are all supplied. There are 2 Royal Suites onboard, both are very large with a separate sitting area and a TV that swivels round so you can watch it in bed. There is a Lounge at the back of the ship with a few tables and comfy rattan style seating, tea/coffee and fruit juice is ALWAYS available here (24/7) as well as cookies, donuts (they were soooooo lush) and muffins. Outside this lounge is the smoking area with a couple of tables, chairs and ashtrays. The lounge has a selection of board games available if you wish to play: Sudoku, Monopoly and Scrabble. Worldwide daily newspapers are printed off for anyone to grab and read, covering British, US, Canadian and Australian news. There were a few books that passengers had left which you are very welcome to take and read, which a lot of people did in this lounge it was very peaceful and quiet. The Main Lounge on Deck 2 has the one bar onboard the ship. The waiter will come to where you are sitting and take your order. Happy hour is every day onboard Tapestry 2, the times are confirmed in the daily newspaper laid on your bed each evening ready for the following day. A Cosmopolitan was €9.80 / Vodka and Coke €8 and then with 50% off during Happy Hour you can become quite Happy! Also in this area was the singer and his keyboard. Old time music sung and played in a very relaxing and friendly atmosphere. It was great to see a few couples having a little dance together. This lounge is also where late night snacks are served at 10.30pm. They did a show one evening and pretty much the whole crew put on a few acts. There is a gym onboard, I had a quick look and saw there were three machines inside. There is a hair salon as well and you can book appointments easily at Reception. Breakfast: Buffet style with eggs, very crispy US style bacon, hash browns and all the usual breakfast greats. Then there’s the Egg Man for specialty eggs, he did have egg fried rice one morning which I thought odd. Lots of sliced meats, fruits, yoghurts and cereals, fruit juices/ teas/ coffee. Lunch: Again buffet style with very nice choices but you can also order from a set lunch menu. Wine and beer etc. comes at an additional charge (But I hear they are going to be including this next year). Dinner: Choose from the menu with many choices including: Veal, Steak, Rack of Lamb, Lobster Tail and many desserts. No buffet option is available at dinner. Wines (1 red & 1 white) and beer are included in the evening meal. All Waiter Service. I personally liked the food, as did everyone I sailed with. So much so that at Breakfast we were talking about what we were having for lunch and at lunch we would be wondering about dinner that evening. One evening including the late night snacks I think we managed 10 courses that day! Fellow passengers I spoke to all praised the food; I did not hear one negative comment about it. There are about 38 staff to 130 passengers onboard and all of the crew members are extremely welcoming and friendly. The Captain even waves you off each morning for the excursions and then is there when you come back. The cruise Director does a fantastic job and knows exactly what type of question passengers would ask before they have even asked. We had one free excursion each day, but there is the option to pay for additional ones if you wish. I did Mal Maison (Napoleon and Josephine’s pad) one day. 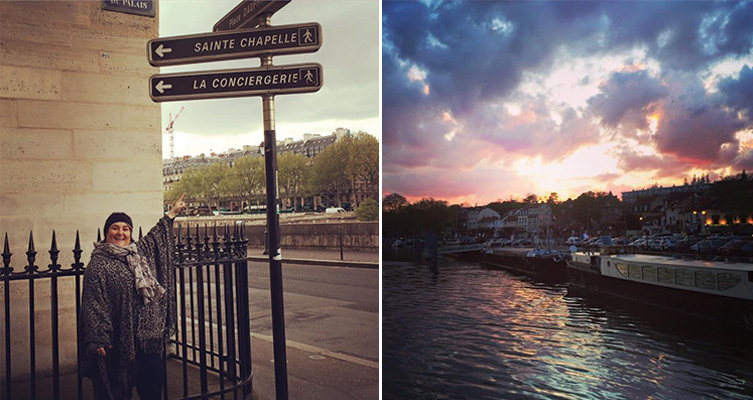 Some people went off in the afternoon to the Palace of Versailles, then in the evening they did the City by Night tour. The next day we did Notre Dame and passengers went off in the evening to see the Moulin Rouge. When you leave the ship you are given a numbered card, when you get back on you need to hand this back in as it lets the crew know that you have returned. Bottles of water are supplied for excursions plus ear piece and device to be able to listen to the tour guide. For UK passengers the cruise price includes tips. Other passengers outside of the UK pay theirs onboard. Avalon offer a pre/post package for passengers to go to London after if they wish or stay on in Paris (this is called Monogramme) many onboard were doing this. 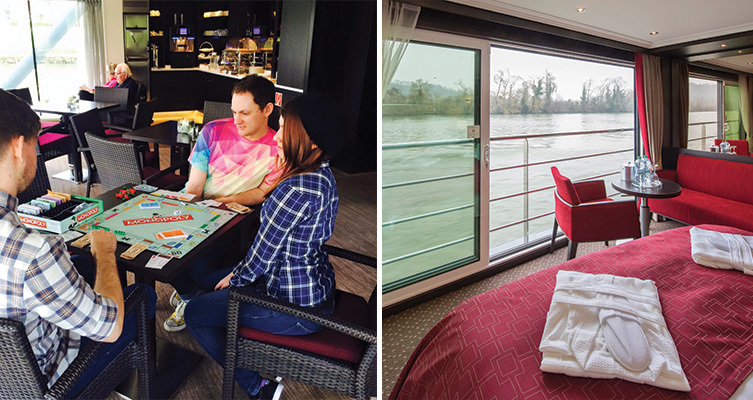 I am not sure what I expected of River Cruising or Avalon, but it wasn’t what I got, the trip surpassed everything I thought it might be. The clientele are generally older in their late 50’s/60’s/70’s and are mainly from the US and Canada (there were 2 Brits on our sailing). Would I book for a week and go? Yes I think I would. To be sat up on the top-deck in the sun watching the world go by in super relaxed surroundings sounds pretty good to me.